Optimism vs caution for using extended-interval dosing to prevent progressive multifocal leukoencephalopathy. Natalizumab (NTZ) is a highly efficacious monoclonal antibody labeled for administration intravenously every 4 weeks at a fixed dose of 300 mg. Use of NTZ has been limited because of elevated incidence of progressive multifocal leukoencephalopathy (PML) among patients who are antibody-positive for JC virus (JCV) and being treated with NTZ.1,2 Although the precise biologic mechanisms for the enhanced risk of PML are not fully understood, many believe that blockade of α4 integrin results in inadequate immune surveillance of the central nervous system (CNS), allowing the JCV to gain a foothold within the CNS, and under the right circumstances, progress to PML. Based on this hypothesis, some practitioners considered extending the interdose interval to 5 to 8 weeks as a means of letting drug action “run down” enough to permit a potentially beneficial immune surveillance to occur between doses and hopefully reduce risk of PML. Those early adopters of extended-interval dosing (EID) used their own anecdotal evidence to target a desired window of drug exposure that still controlled disease activity. Safely decreasing risk of PML, a devastating disease, is very important for patients with MS being treated with NTZ and minimizing this risk could increase the treatment options available for patients with highly active disease. For EID to be a viable alternative, efficacy in controlling disease must be maintained with reduced risk of PML. To that end, 3 retrospective studies demonstrated similar efficacy between SID and EID cohorts.3,5,6 To confirm these preliminary results, a large prospective, controlled studya in which patients will be randomized to either SID (every 4 weeks) or EID (every 6 weeks) protocol is underway. Clinical measures and laboratory biomarkers including MRIs, Expanded Disabilities Status Scale (EDSS) scores, performance metrics, blood biomarkers, and patient-reported outcomes are being measured throughout the 72-week study. Because of the low incidence of NTZ-associated PML in general, the study could not be powered to further assess PML risk. As evidence of decreased PML risk from EID without change in NTZ treatment efficacy accumulates, more attention is being placed on pharmacokinetic and pharmaco-dynamic markers and the mechanistic underpinning related to EID for NTZ therapy. An investigator-initiated trial of real-world patients conducted by myself and colleagues found that nadir blood levels of NTZ varied nearly 100-fold across patients treated with SID (Figure), demonstrating variable pharmacodynamics among patients.7 Variability was also observed in the amount of NTZ binding to its target (referred to as VLA-4 receptor occupancy) and in the levels of VLA-4 expressed on immune cell surfaces (exposure to NTZ generally decreases VLA-4 expression by about 50%). This gave rise to the hypothesis that a certain proportion of the NTZ-treated patients may have excessive restriction of immune cell trafficking into the CNS, leading to inadequate CNS surveillance for mutant JCV. In patients treated with EID, mean NTZ blood levels were reduced by approximately 50%, VLA-4 receptor occupancy was decreased, and VLA-4 cell-surface expression was increased—all of which likely lead to increased immune cell entry into the central nervous system (CNS), potentially affecting PML risk. Figure 1. 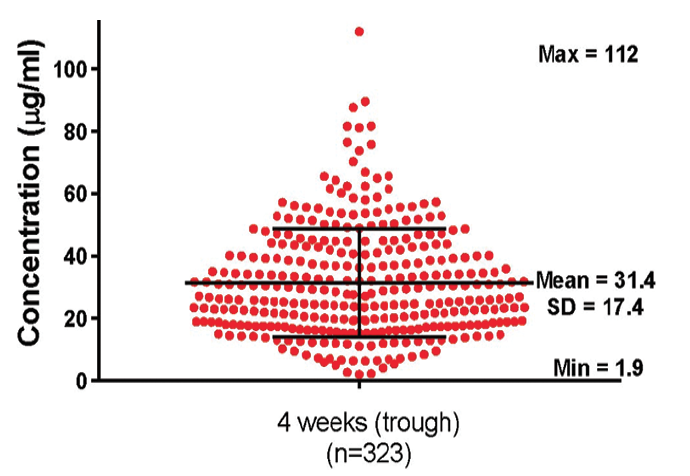 Natalizumab serum concentrations, overlaid with the mean +/- standard error of mean (SEM) in samples collected from individuals treated with standard-interval dosing. A working hypothesis that provides a biological explanation for the EID effect is that of selective CNS immune surveillance. This theory states that as blood levels of NTZ decrease, adhesion to the blood-brain barrier (BBB) may be reinstated for some select populations of immune cells with sufficient numbers of open VLA-4 receptors. Among these adhesion-competent cells is a population that can clear JCV. There are data suggesting that an individual’s immune cell types such as naïve and memory CD4, CD8, and CD20 cells have variable amounts of VLA-4 manifest on their cell surfaces, producing a variable number of open receptors when exposed to the same circulating concentration of NTZ.8 With this hypothesis, the immune cells responsible for MS activity do not have enough open receptors to facilitate adherence and trafficking across the BBB when exposed to an EID regimen. Great advances in MS therapeutics have been made; however, higher-efficacy agents pose greater risks and require careful consideration. For NTZ, years of postmarketing experience continues to affirm its high efficacy and minimal side-effect profile. The primary safety concern is a risk of PML. Research thus far shows that EID yields a significant reduction in PML risk while being well tolerated with similar efficacy to standard dosing. In the appropriate patient felt to have risk factors for PML, EID has become a feasible clinical option when a high-efficacy therapy is desired. We remain optimistic that further research and clinical experience will validate the use of this approach for improved quality of life for patients with MS. There are several important reasons to be cautious about these reports. Retrospective studies are intrinsically less reliable than prospective controlled experiments, with a variety of unintended biases that are often hard to detect. The data from the TOUCH registry, which are yet to be published, come from a careful and multifaceted analysis and still may not have uncovered the reason for marked apparent safety benefit of EID.4 The definitions for appropriate EID are unknown and data collection was not uniform in that the intervention was variable. Because PML is fortunately still rare even under the worst circumstances in this population, the numbers of cases to determine longer-duration intervention value are quite sparse. It is also likely that implementing withdrawal of NTZ in the face of other known risks (JCV antibody positivity, longer duration use, and prior immunotherapy1) is resulting in a treated population with declining risk of PML that might be coinciding with implementation of EID. Thus, apparently declining risk may in fact be caused by mechanisms other than the dosing interval change. Although prospective randomized implementation of EID may be needed to ascertain its real protective value, proof of the protective value of this intervention will be difficult to attain because high-risk patients are discontinuing NTZ and reported cases of PML are decreasing. Early implementation of EID without more careful consideration of the potential impact on control of MS should be avoided. A more systematic analysis of the efficacy of EID for MS control is indicated. Although early reports suggest overt exacerbations are not much changed, one of the striking benefits of NTZ has been slowing overall disability status,10,11 which may not be entirely linked to exacerbation rates. Responsible development of a change in recommendations should be supported by a careful assessment of the full implications of EID on treatment efficacy. 3) a small increase in dosing interval is unlikely to result in the apparent reduced risk of PML. I can understand his concerns regarding potential selection bias in retrospective studies. However, as he pointed out, PML incidence in patients treated with NTZ is sufficiently low that a prospective large-scale trial to assess PML risk with EID is not feasible. It is worth emphasizing that the retrospective study was carefully performed using 3 different definitions of EID to ensure robustness of the results.4 In addition, study groups were similar with respect to JCV-antibody positivity and prior immunosuppressant exposure (2 of the 3 well-established risk factors for PML). The other primary risk factor, treatment duration, was actually longer in the EID cohorts. Moreover, prespecified sensitivity analyses and post hoc analyses were conducted to evaluate whether manipulation of cohort selection with respect to these variables could affect the study results, and in all cases, the results remained consistent. Although the possibility of an unknown bias cannot be fully eliminated, we have attempted to minimize it. Better understanding of the underlying mechanism of PML development with NTZ therapy is essential. Given the data available to date, the theory that adhesion restriction at the endothelium produces impaired immune-cell trafficking and reduced immune surveillance in the CNS remains our most attractive hypothesis mechanistically, although a contributory peripheral process cannot be excluded. One of the strongest pieces of evidence supporting this concept is the fact that both NTZ and efalizumab (a drug transiently on the market to treat psoriasis) are associated with a similar rate of PML with minimal increases in other CNS infections.12 Both drugs are potent inhibitors of immune cell adhesion and trafficking at the endothelium. This would suggest that excessive adhesion inhibition at the endothelium may well be the dominant mechanism involved in PML generation. Although it is indeed somewhat surprising that there was such a large effect size of EID on PML risk given that the average dosing interval differed by only 5 to 12 days from the usual 28 days (SID), we and others have observed approximately a 50% reduction in NTZ blood levels at nadir timepoints with 5- to 6-week EID.13 This results in a significant decline in VLA-4 receptor occupancy and an increase in VLA-4 receptors at the immune cell surface, potentially leading to increased cell adhesion to brain endothelium and an increase in JCV immune surveillance. In addition, JCV is likely very vulnerable to cellular immunity (given the very low prevalence of PML in the general population); hence, small increases in CNS immune surveillance with EID could very well be sufficient to hinder PML initiation and propagation. In individuals who are JCV antibody positive for whom use of the drug is felt appropriate, based on preliminary data, the relatively low risk of breakthrough MS is far outweighed by the apparent reduction of PML risk. In this scenario, EID dosing may well be a viable treatment option. I believe that ultimately understanding the mechanism of NTZ-associated PML risk is at the heart of future investigations. More detailed evidence about selective immune surveillance in the CNS requires more data to be reassuring to this scientist. Isolated breakdown of JCV surveillance seems a theory of convenience for the time being, while the preponderance of evidence, based on many potential opportunistic pathogens (consider all the pathogens patients with AIDS suffer) that fail to be significant problems during NTZ treatment, suggests that the true culprit in PML incidence in this setting is not the integrin-gated BBB but rather peripheral changes influencing this virus that result in increased risk of neurotropic changes in the presence of NTZ. Less-frequent dosing may lessen these risks as well but is unlikely ultimately to achieve the apparent massive protection currently being touted as a product of EID. For some reason, the opportunistic problem with NTZ is unique to JCV, suggesting that the BBB is unlikely to be the best explanation for risk. If this is the case, ultimately EID will not be dramatically protective, but it may take some years to detect this. If safety relative to MS progression is assured, ongoing long-term surveillance with broad use of EID will still be required to assure that this strategy can produce its desired goal. a. A study to evaluate efficacy, safety, and tolerability of 6-week extended interval dosing of natalizumab (BG00002) in participants with relapsing-remitting multiple sclerosis (RRMS) switching from treatment with 4-week natalizumab standard interval dosing (SID) in relation to continued SID treatment (NCT03689972). 1. Major EO, Yousry TA, Clifford DB. 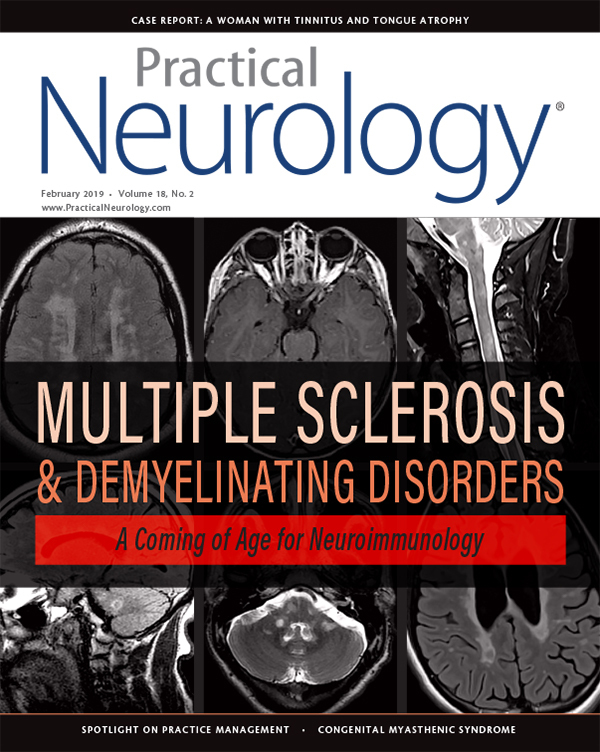 Pathogenesis of progressive multifocal leukoencephalopathy and risks associated with treatments for multiple sclerosis: a decade of lessons learned. Lancet Neurol. 2018;17:467-480. 2. Yousry TA, Major EO, Ryschkewitsch C, et al. Evaluation of patients treated with natalizumab for progressive multifocal leukoencephalopathy. New Engl J Med. 2006;354:924-933. 3. Zhovtis Ryerson L, Frohman TC, et al. Extended interval dosing of natalizumab in multiple sclerosis. J Neurol Neurosurg Psychiatry. 2016;87:885-889. 4. Zhovtis Ryerson L, Foley J, Chang I, et al. Natalizumab extended interval dosing is associated with a reduction in progressive multifocal leukoencephalopathy risk in the TOUCH registry. Poster presentation at American Committee for Treatment and Research in Multiple Sclerosis 2018 Annual Conference; Feb. 1-3, 2018; San Diego, CA. https://actrims.confex.com/actrims/2018/meetingapp.cgi/Paper/3102. Accessed January 7, 2018. 5. Bomprezzi R, Pawate S. Extended interval dosing of natalizumab: a two-center, 7-year experience. Therapeut Adv Neurol Dis. 2014;7:227-231. 6. Yamout BI, Sahraian MA, Ayoubi NE, et. al. Efficacy and safety of natalizumab extended interval dosing. Mult Scler Rel Dis. 2018;24:4. 7. Foley HT, Christensen A, Riddle E, et al. Natalizumab extended interval dosing reduces serum through natalizumab concentrations and a4 integrin receptor occupancy. ECTRIMS; 2016; London, England. 8. Harrer A, Wipfler P, Einhaeupl M, et al. Natalizumab therapy decreases surface expression of both VLA-heterodimer subunits on peripheral blood mononuclear cells. J Immunol. 2011;234(1-2):148-154. 9. Baldassari LE, Jones SE, Clifford DB, Fox RJ. Progressive multifocal leukoencephalopathy with extended natalizumab dosing. Neurol Clin Pract. 2018;8:e12-e14. 10. Confavreux C, Vukusic S, Moreau T, Adeleine P. Relapses and progression of disability in multiple sclerosis. N Engl J Med. 2000;343(20):1430-1438. 11. Zivadinov R, Hojnacki D, Bergsland N, et al. Effect of natalizumab on brain atrophy and disability progression in multiple sclerosis patients over 5 years. Eur J Neurol. 2016;23(6):1101-9. 12. US Food and Drug Administration. FDA statement on the voluntary withdrawal of raptiva from the US market. Bethesda, MD; 2009. https://www.fda.gov/Drugs/DrugSafety/PostmarketDrugSafetyInformationforPatientsandProviders/ucm143347.htm. Accessed January 9, 2019. 13. Foley J, Metzger R, Hoyt T, Christensen A. The effect of dosing interval extension and patient weight on long term natalizumab pharmacokinetics. Neurology. 2015;84 (14S):P3.258. 14. Meira M, Sievers C, Hoffmann F, et al. Natalizumab-induced POU2AF1/Spi-B upregulation: a possible route for PML development. Neurol Neuroimmunol & Neuroinflamm. 2016;3:e223. DBC is supported by NIH grants NS10719801, AI06943912, AI06863611, MH10734504, UL1TR00234502, AG04517904, and AG05326702; receives research sup- port from Lilly and Roche; and has provided scientific advisory or consulting to Amgen, Biogen, Dr. Reddy, Inhibikase, Genzyme/Sanofi, Takeda/Millennium, EMD Sorono, Roche/Genentech, Novartis, GSK, BMS, Pfizer, Shire, and Wave. JFF is on the following speaker’s bureaus: Biogen, Genzyme-Sanofi, and EMD Serono; has participated in scientific advisory boards with Biogen, Genentech, Genzyme, Celgene, and EMD Serono; receives research support from Biogen, Novartis, Genentech-Roche, Genzyme-Sanofi, Mallinckrodt, and Adamas; and has ownership interest in Abreos Bioscience. Telemedicine is acceptable to patients and clinicians in the continuum of clinic-to-in-home care and reduces barriers to care. It is critical to maintain a high index of suspicion for these conditions when evaluating a patient with demyelination to avoid delays in treatment. Accurate diagnosis requires correspondence to typical clinical syndromes, correct interpretation of radiologic and CSF data, and thorough evaluation for mimics. A number of agents with putative neuroprotective effects have shown promise in recent clinical trials. Extensive workup is necessary when evaluating individuals with seizures and behavioral changes.